Join popular Yorkshire artist John Harrison whose emphasis is on line drawing, with light watercolour washes. 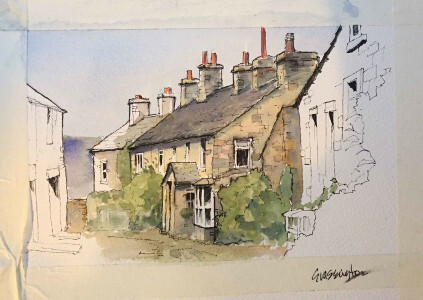 This one day workshop will include outdoor sketching, ink drawing and application of washes to create a loose, lively painting style of iconic Yorkshire Dales features. All reference material, exercise handouts, the appropriate watercolour paper and pens are included, but please bring your own paints, brushes and a sketchbook. Broadrake is in a stunning location and there is no shortage of subject matter - dry stone walls, barns, limestone outcrops, viaduct, trees and fellside slopes.The venue is upstairs in a recently converted barn. Refreshments available all day but please bring your own packed lunch. John is Yorkshire born and bred, proud of his home county which provides the inspiration for much of his work. 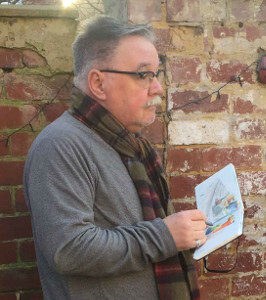 He specialises in line and wash, a style which superbly captures the beauty and atmosphere of Yorkshire's landscape, towns and villages and John is now proud to be featured monthly in the Dalesman magazine.